A healthy snack that is easy to make! Protein packed, full of omegas, and fiber . 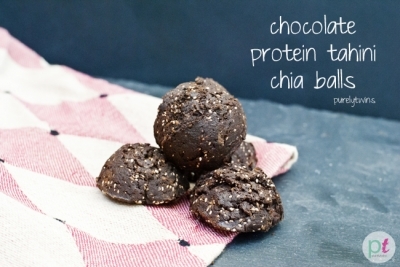 In a large bowl, place your protein powder, cocoa, and chia seeds. Mix. Add in your sweetener. I used liquid stevia, but if you wanted to use another sweetener you will have to adjust your wet ingredients, either by omitting the coconut oil or reducing the tahini, or both. Next add in your coconut oil and tahini (or nut butter). Now something about this recipe â€“ tahini could be thick or runny. So you can add more cocoa powder and chia seeds to help hold them together. And these are best cold in fridge to keep their shape. 1 1/2 tbsp cookie scooper to get 5 balls. So depending on what size you use or what/how much ingredients you use will alter the number of balls. When making these tahini cocoa balls, remember to start with dry ingredients and slowly add in your wet ingredients, and adjust accordingly. One great thing about this recipe is that it is easy to add or take out ingredients to get the desire protein ball you are looking for.